This week (March 5-9), many PSD schools are participating in the R-Word Campaign. March 7, 2018 marks the annual day of awareness. 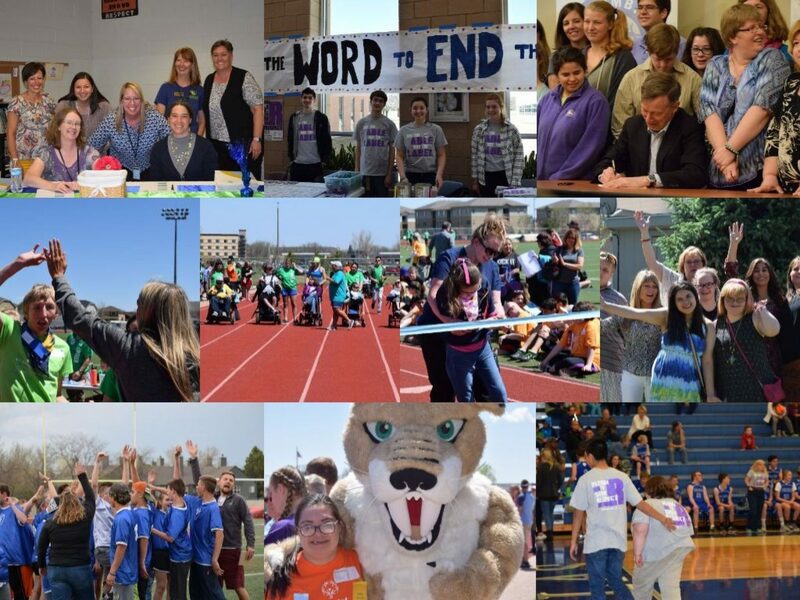 Read on to see how some of our schools are supporting students of ALL abilities by “Spreading the Word to END the Word”! Selling R-Word shirts all week, with a table set up during common lunch on Wednesday and Thursday (March 7 & 8). A banner will be available for all students to sign; posters will be hung; R-Word bracelets will be handed out to students and staff. Videos will be looping on a laptop screen to demonstrate why the R-Word is hurtful. On March 7, tables will be set up during lunch (11:30 AM – 12:20 PM) with banners, candy, t-shirts, and bracelets. A projection screen will display a slideshow of RMHS students and peer helpers, along with a sound system playing a playlist chosen by the students. Commercials have been running on video announcements as a promotion for this week, and student-led homeroom announcements will broadcast all week. Staff donated over $500 to ensure that enough t-shirts and bracelets are available for this event! An entire day of events is planned at Olander on March 7. Combined specials classes will assemble in the gymnasium, where each grade will participate in disability simulations; discussing how they can help promote respect for everyone. Students and staff will be wearing t-shirts and bracelets, as well as signing campaign banners that will hang throughout the school. This is just a sampling of activities held at various PSD sites. Thank you to all of our participating schools for your dedication in making school a happy, safe place for ALL students!